While weekday lunch time aqua jogs are a bit hurried, a Sunday afternoon trip to the pool with MT allowed for a very thorough workout and some serious hot tub action which my body appreciated. I’ve recommitted to rehabbing my ankle. My next race is in two weeks (I swear I signed up for all these races before hurting myself!) so I’ve got a nice little chunk of time to rest and take care. I was starving when I got home from the pool workout, but managed to get my lawn mowed and a hedge trimmed before I started dinner. I realized I only had one chicken breast (time to run to Costco) but managed to stretch one breast into a meal for two by adding red pepper, onion, and mushrooms to a saute. 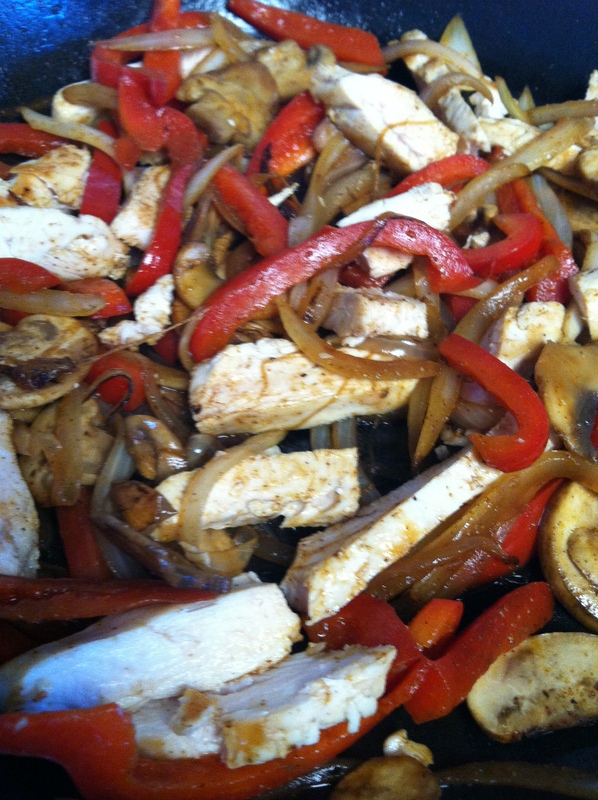 A little cumin and chili powder, salsa and sour cream sides, and Mr. and I had ourselves some delicious chicken fajitas! In an attempt to use what’s in the fridge, I pulled out a bag of brussel sprouts that badly needed to be used and steamed them up as a side. Maybe not the most conventional side for the main dish, but whatevs. 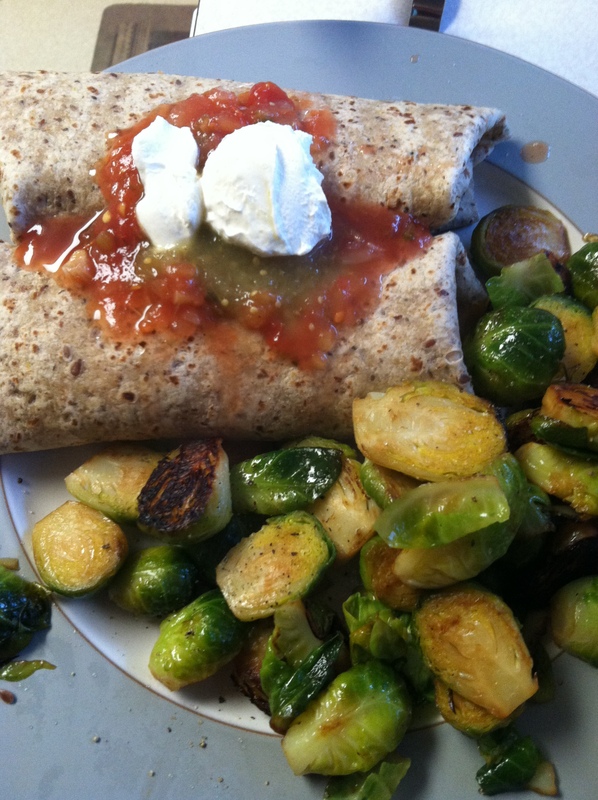 If you don’t already know, you’ll quickly find out I eat brussel spouts with anything and all the time. What food do you like/love that many people dislike? I won’t yuk your yum, I promise! 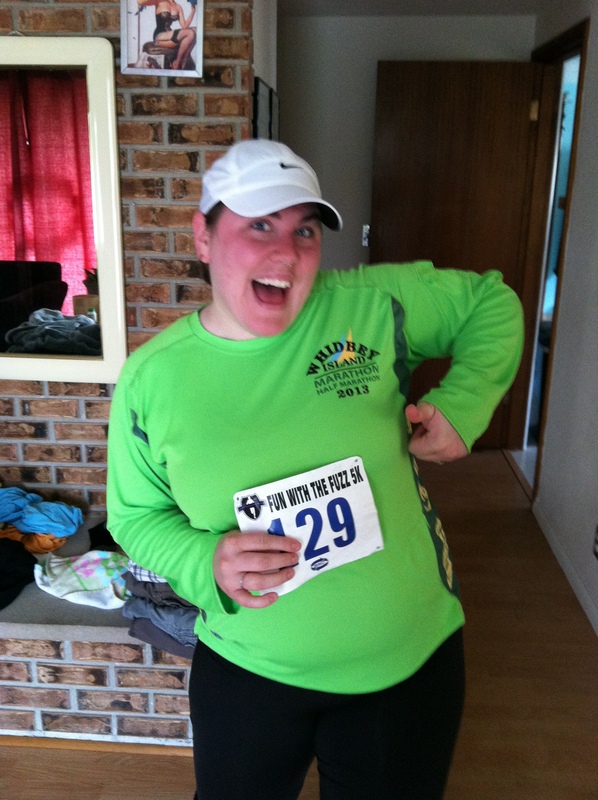 I got to wear my wonderful Whidbey Half shirt at a race this weekend. Not gonna lie: I felt pretty cool. I ran the Fun with the Fuzz 5k which is a fundraiser for the Behind the Badge Foundation which supports families of fallen and injured officers in Washington State. It was a large group of racers which made the first mile a tough one for me as I got swept up in a pace that was a bit much. I know I’m not alone when I say I often start a race too fast; the excitement, the anxiety, the being passed by runner after runner… it all adds up to just running too fast. It also meant I burned out quickly. Add on to that the fact that I’m working with a sub-par ankle and that it was only 6 days since running my first half marathon and that equals a little bit of pain. Soreness to be more accurate. My ankle, although on the mend, was none too pleased and some muscles that were sore after the 13.1 flared up again. Nothing too drastic and nothing a nice pool workout on Sunday couldn’t fix. Not my best time ever in the race, but not my worst. I’m happy I was able to run and happy to support such a wonderful cause. My running buddy (MT from now on) and my husband (Mr. from now on) were at the finish line to greet me which was very fun. They both ran the race as well! What is it about the pool that makes one ferociously hungry after getting out?! I’m going to have to remember this for the upcoming weeks as I’ve added lunch time aqua jogging with my favorite running buddy to my regimen. Must bring a bigger lunch on Thursdays to satiate this special kind of hunger. Aqua jogging is a wonderful way to rehab my ankle while still getting in some great cardio and working out muscles that are less used in dry land running. I’m hopping it will add some variety to my half marathon training and be a peek at getting ready for a triathalong (my 2014 goal). Also, there is a hot tub which I can visit after “running” which, in and of itself, makes the whole thing worth it! I am very excited about this new addition to my workouts not only because it will be good for me physically, but I think it will do me lots of good mentally as well. To intentionally take a break from the desk and get some exercise is crucial to my sanity. I have a weekly walk with a colleague/friend on Wednesdays and that is always so delightful. Plus, although my best running buddy and I get coffee together each morning, it isn’t nearly enough time to really get in a good chat. I might need some sweet goggles like that pug is wearing.